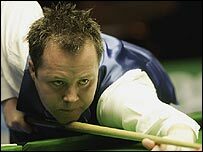 Masters champion John Higgins battled through a bout of food poisoning to reach the last eight at the Malta Cup. Higgins, who had been unable to eat for two days, beat fellow Scot Alan McManus 5-0 and will next meet Stephen Hendry. Hendry was a 5-2 winner over Barry Pinches while Scotland's Stephen Maguire beat Mark King 5-3. Welshman Mark Williams claimed a 5-1 victory over Nigel Bond but world champion Shaun Murphy lost 5-4 to Graeme Dott after leading 4-2. "I feel totally drained," said Higgins, recent winner of the Masters event at Wembley and the bookmakers' favourite to claim the first world-ranking title of the year. "In all the time I've been playing snooker I've never felt like this. I felt as though I could miss anything and on certain shots I had double vision. "Right from the start I was really light-headed but thankfully Alan didn't play well enough to put me under pressure." Maguire put his win over King down to his greater maturity. It is the first time the 24-year-old has reached the last eight of a world-ranking event since he won the UK Championship title in December 2004. "I've been acting like a spoiled brat but now I'm trying to win or lose like a man," said Glaswegian Maguire. "This season my head's not been right. Now I'm determined to play properly." Maguire used his new sense of focus to battle back from 2-1 down with breaks of 76 and 66. Then King levelled the match to 3-3 before the Scot controlled the seventh frame and took the next on the green to wrap up the match. Maguire now meets former world champion Ken Doherty for a place in the last four after he beat in-form Stuart Bingham 5-4. Bingham had amassed a 3-0 lead before leaving a final black in the jaws of a top-corner pocket. Doherty wrapped up the frame and then won four of the next frames with only one half-century break. "It was a gritty performance that's given me a chance to get a run going and build my confidence," said the Dubliner. Finland's Robin Hull, the first round conqueror of Steve Davis, secured only the second world ranking event quarter-final of his 13-year professional career with a 5-3 win over Barry Hawkins.